Many of a material’s properties depend on the way its molecules are arranged. Since the late 1930s, physicists use a mathematical model to describe the molecular order of liquid crystals. The so-called order parameter assigns a number that indicates how well ordered the molecules are. This model uses a positive range to describe the liquid crystals that we are used to. It can also assign a negative range that describes an « anti-ordered » state, where the molecules would avoid a certain direction rather than align along it. So far, this negative range remained strictly hypothetical, as no liquid crystal developed an anti-ordered state in practice. The standard theories for liquid crystals suggest that such a state is possible, but would not be stable. « You can compare this to a slide that has a very light bump in the middle. You may slow down when you reach the bump, in our case the unstable anti-ordered state, but not enough so you stop, and therefore you will go down all the way to the stable state, the global energy minimum, where you inevitably end up with positive order. If you could manage to stop the ride at the bump, a negative range would be possible, » explains Jan Lagerwall. This is exactly what V.S.R. Jampani, the main author of the paper, and co-workers achieved for the first time in their study. « The trick for preventing the system from reaching the global energy minimum is to gently polymerize it into a loosely connected network while it is dissolved in a normal liquid solvent, » says Dr. Jampani. « This network is then stretched in all directions within a plane, or compressed along a single direction perpendicular to the plane, such that the molecules forming the network align into the plane, but without any particular direction in that plane. » As the solvent is evaporated the liquid crystal phase forms and, due to the peculiar in-plane stretching of the network, it is forced to adopt the negative order parameter state where the molecules avoid the direction of the normal to the plane. « This liquid crystal has no choice but to settle with the secondary energy minimum, since the global energy minimum is made inaccessible by the network, » adds Lagerwall. When the network is strengthened by a second round of polymerization, the behavior as a function of temperature can be studied. « Liquid crystal networks are fascinating for positive as well as negative order parameter, because the ordering—or anti-ordering—in combination with the polymer network allows it to spontaneously change its shape in response to temperature changes. The liquid crystal network is effectively a rubber that stretches or relaxes on its own, without anyone applying a force, » says Prof. Lagerwall. It turns out that the behavior of the negative order parameter liquid crystal rubber is exactly opposite to that of normal liquid crystal rubbers. « Optically, when a normal liquid crystal rubber shows a certain color between crossed polarizers, the negative order parameter version shows the complementary color. Mechanically, when a normal liquid crystal rubber contracts along one direction and expands in the plane perpendicular to it, the negative order parameter rubber expands along the first direction and shrinks in the perpendicular plane, » Lagerwall explains. 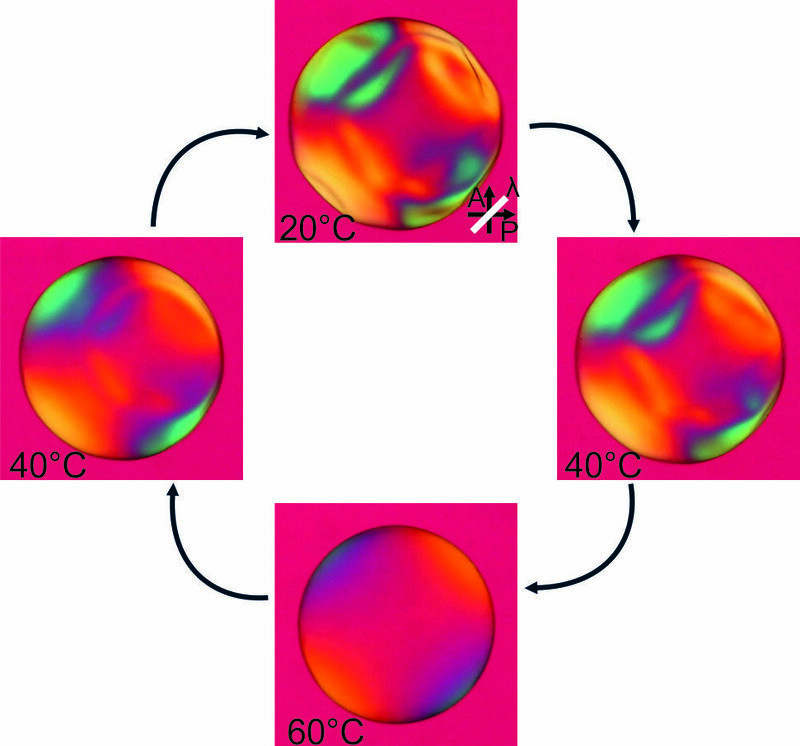 The researchers created their negative order parameter liquid crystal rubbers in the form of millimeter-sized spherical shells, which they then cut into smaller pieces with various shapes. Depending on how the cut was made, a variety of shape changing behavior could be realized, showing that the system can function as a soft « actuator, » effectively an artificial muscle. Because the negative and positive order liquid crystal rubbers act in opposite ways, this opens for interesting ways to combine the two, to make a more effective composite actuator, for instance for soft robotics. When the positive-order actuator responds slowly, the negative-order one actuates quickly, and vice versa. From a fundamental physics point of view, the physical existence of the previously only theoretically predicted anti-ordered liquid crystal state opens for many interesting experiments as well as theory development for the behavior of self-organizing soft matter.